Offering you a complete choice of products which include gold coin & bar making machine, hydraulic gold & silver coin cutting machine and gold coin cutting hydraulic machine. Hydraulic Bars & Coin stamping machines (Fully Automatic & Eject Function equipped with electronic programmble controller PLC Monitor with Auto Ejector for easy removal of finished coin with built in safety feature.Manual Option also available. 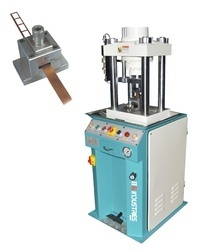 Sheet Rolling Machines for Flattening Gold Silver Sheet as per Weight. India's Leading Goldsmith Machinery Manufacturing From H.K.Malvi Industries , Serving major gold minting and jewelry industries worldwide. With assistance of technically assisted facilities, we are presenting Hydraulic Bars & Coin Cutting Blanking Machine. 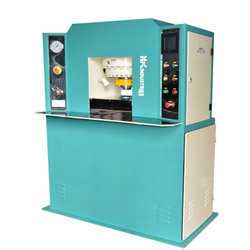 This machine is provided in several specifications as per the needs of customers. 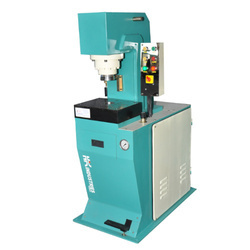 The offered machine is manufactured using top class components and modular technology, under the direction of experts. Our customers can avail this machine from us as per their needs at industry leading rates. The Machine is Designed for Cutting Blanks for Gold & Silver upto 250 Gram in any Shape having a thickness capacity of 8 mm cutting . It is Heavy Four Pillar base hydraulic Operating Cutting Machine.